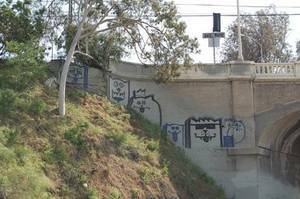 ALHAMBRA — Authorities arrested an Alhambra man Wednesday on suspicion of scrawling graffiti images of cats throughout the Los Angeles area. Rick Ordonez, 33, was booked on suspicion of felony vandalism, Los Angeles County sheriff’s Detective Marlon Johnson said. He is suspected of causing about $15,000 worth of damage to freeways, buildings and private property this year, the detective said. His drawings were mainly of cartoon cats, officials said. Through informants and tips, officials identified Ordonez as a suspect in the vandalisms and arrested him without incident Wednesday at his home in the 200 block of Elm Street in Alhambra, Johnson said. Detectives first noticed the appearance of the cats at the beginning of the year. Ordonez, a graphic designer and former skateboard shop owner who goes by the nickname “Atlas”, is believed to belong to a Los Angeles-area tagging crew, though the investigation focused solely on him as an individual, Johnson said. Officials said Ordonez was due in Los Angeles Superior Court Tuesday for arraignment. According to sheriff’s booking records, Ordonez was being held in lieu of $50,000 bail. HIT ME UP IF ANYONE WANTS A free [FREE ATLAS] SHIRT. IT’LL BE ORIGINAL, AND AWESOME. MADE BY A 10 YEAR GRAFF ARTIST.